Hi people! here i repost one of EDSA's posting (write by me too actually), that is about an attractive event that will be held presently by EDSA collaborated with @iiwcindonesia. Check it out! International Talkshow: Care for Street Children. 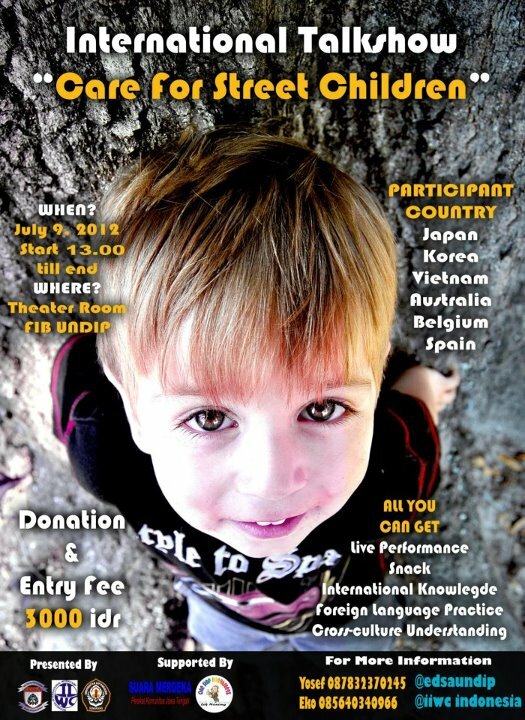 This event is awesome, we are going to present 11 foreign volunteers from Aussie, Belgium, Japan, Korea, Spain, and Vietnam. We have an unique system, participants will go the room that suits their passion to interact more closely with its foreign speakers. It means that you can choose your own country that you like and go to their room, so you can focus on the one country only. The speakers are IIWC volunteers. Theater room Faculty of Humanities Diponegoro University. By joining here you can gain your global knowledge, and surely you will get any International friends. CAUTION! Highly beneficial to participants. So what are you waiting for? Come and join us!